Ever since I first tried VR, I knew I had to own a headset. I finally do, and I’m really pleased with it. I was more excited leading up to the release of the PlayStation VR than I remember being for any other recent tech product launch. Mine arrived last week and a lot of people have asked me what it’s like, so I figured I’d write up my thoughts. The headset itself is really comfortable. The design, build quality, and materials that Sony have used are excellent. The inner padding of the headset is a really nice textured rubber, and it feels great and looks very premium. The headset is also very easy to put on. No awkward velcro straps like the Vive or Rift. There’s just a sturdy band that fits around your head, and a small dial to turn to tighten it once it’s on. Once it’s in the right place you can slide the actual visor (containing the screen) forward and backward, so you can move it closer to your face and find the ‘sweet spot’ where it’s in focus. 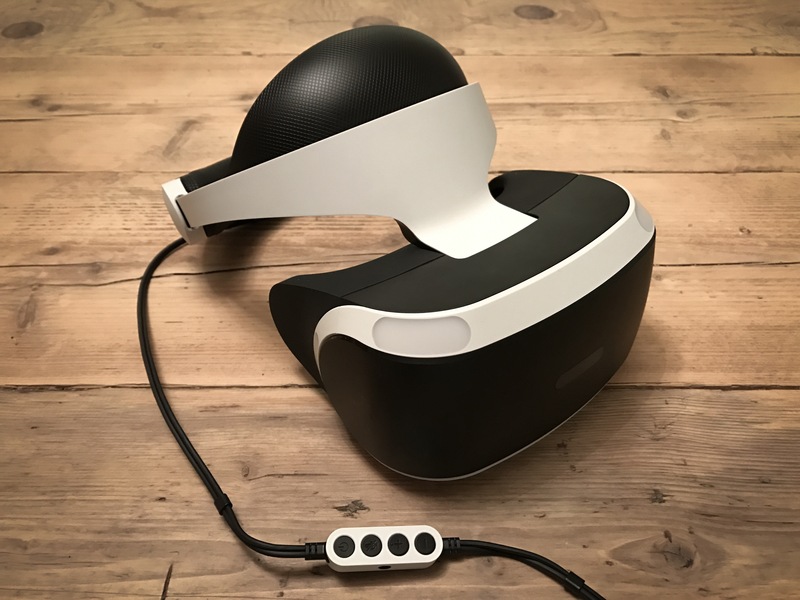 Whereas the Vive and Rift screens are pulled tight against your face like a pair of ski goggles, the PSVR comfortably hangs in front of your eyes. And it works really well with glasses! Sony paid particular consideration to users with glasses, and for me at least it’s very comfortable. Whenever I’ve used a Vive or a Rift in the past, I’d have to put it on in an awkward way to fit around my glasses, and they’d get stuck inside it when I took it off. There’s a small amount of ‘light leak’ at the bottom of the headset, where you can see the real world if you look down. Apparently this was an intentional design on Sony’s part, to allow people to ‘ground’ themselves if necessary. I have to say that once I’m playing a game, I don’t notice it at all. Setup was very easy, despite there being quite few cables involved. The cable from the headset to the processor unit1 felt to me to be much thinner and less intrusive than either the Vive or the Rift’s cables. It also contains a useful little inline remote into which you can connect a pair of wired headphones (which receive full 3D audio). The remote allows you to change the volume, turn the headset on and off, and mute or unmute the headset’s microphone. I’m impressed by the quality of the PSVR’s display. The colours are great, it’s bright, and there’s little to no screen door effect2. It’s not the highest resolution (it’s marginally lower than the Vive and the Rift), but I can live with that as it’s just a reality of where VR tech currently is. It also seems like it’s the games that are mainly letting things down on the resolution front – in a game that’s rendering at a resolution higher than that of the panel (‘supersampling’), such as Job Simulator which runs at 1.4x resolution, things look quite sharp. Other games are clearly running at a lower resolution in order to get the required performance, and it shows. EVE: Valkyrie in particular gets very blurred at a distance, and whilst I haven’t played it I’ve heard that Drive Club has big resolution issues. I think the PS Pro should help in this regard, as it’ll allow games to render at higher resolutions. The only other issue I have with the screen would be that it has a fairly prominent ‘mura effect’ in dark scenes. This is where you can see a random pattern of slightly lighter coloured pixels across the screen. It essentially means that dark / black scenes aren’t truly black, and instead are like looking at a dark grey textured pattern which moves with your head. It’s not awful, and it’s easy to look past, but it’s there. If you’ve never experienced VR for yourself, it’s difficult to convey what it’s like. Not only does the game surround you everywhere you look, but the sense of depth and scale is incredible. It’s like nothing else. The head tracking on the PSVR generally works really well; the framerate is excellent, and the gameplay very smoothly follows your head movement. Head tracking in general works well, and rotational tracking (tilting your head to look in different directions) is certainly spot-on. I’ve had a few small issues with positional tracking (your 3D positioning in the world, as you move forward / backward / left right) in some games and when sat further away from the camera. In particular, in the demo of Job Simulator, the environment around me continually moves forward and back slightly whilst I’m stood still, which can result in you feeling a little weird / drunk. Both headset and controller tracking3 rely on the PlayStation Camera (required for PSVR, but not included with the headset) tracking the visible light from their bright LED strips. Occasionally the controllers also suffer from some ‘jitter’, and if their LEDs aren’t visible to the camera they can disappear in games entirely. For the most part it works well enough, although one can certainly question Sony’s decision to base fairly critical parts of PSVR on slightly flaky 6 year old technology (although presumably cost was a big factor). Having used both the Oculus Rift and HTC Vive, I can say that both of their tracking systems are rock solid in comparison. The tracking is my only real complaint about the whole experience, and it’s not enough to put me off PSVR or rely detract from gameplay at all. Most of the time it’s fine, and I think as a more technical user I’ve actively been analysing how well things perform and looking for problems. Most people probably won’t even notice. Sony have done a good job of delivering convincing, immersive VR at a much lower price than either the Vive or the Rift. And that’s just the cost of the headset – I also don’t need to buy or maintain an expensive PC, which is a huge plus for me. Whilst the visuals may take a bit of a downgrade, and the tracking isn’t as good, it’s plenty good enough to fool your brain4 and there are some fantastic games and ‘experiences’ available. In fact, I think one of PSVR’s stand out features (besides cost and easy of use) is that it has a great lineup of launch titles. In the next post, I’ll give a brief opinion on each of the games I’ve tried so far.